I’m delighted to be heading to The Sydney Writers Festival May 18-24 to talk about my work. The first occasion on Thursday 21 May will tell the curious story of what critics and philosophers have made of van Gogh’s painting of The Shoes aka Boots with Laces (1886), and asking why the artist chose this subject. 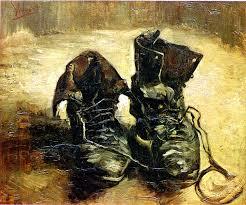 You can check out the whole story in A Shoe Story Van Gogh the Philosophers and the West. On Friday 22 May Luke Fischer, Peter Morgan and I will be talking about that unique poet, born in Prague, writing inimitable German, Rainer Maria Rilke. I’ll be particularly interested in the impact his visits to Russia had on him, and also the one novel he wrote, about his struggling life in Paris, before he was recognized as a genius. Saturday 23 May I’ll be leading an all-day workshop on Writing and Travelling, without which, surely, there cannot be happiness in this life. We’ll be talking about different kinds of travelling (including with the eighteenth-century writer Xavier de Maistre, going nowhere), travelling and politics, and different styles of writing, from the guidebook to the personal adventure. I’ll also be talking, at the Art Gallery of New South Wales, about the extraordinary reception of van Gogh in Germany, from the beginning of the twentieth century to the outbreak of the second world war. The text of my March 2, 2015, talk at London’s National Gallery: Van Gogh and the Limits of the Market will go up on my blog shortly. and was the question I set out to answer in my talk. The aim of the evening, which kicked off a season of talks about Shakespeare and Modernism/Shakespeare and the Modern Writer, was to use both of these giants to get a better sense of where literary modernism came from and where it was going. I situated both Shakespeare and Wagner in a philosophical context, while keeping in mind a composite early Modernist ‘writer’ with characteristics shared by Baudelaire, Nietzsche, Thomas Mann and Proust. Not the whole of Modernism by any means, but a large chunk of what we mean by Early Modernism. My host was KiSS- the Kingston University Shakespeare Seminar. Professor Richard Wilson runs a vibrant group where all are welcome to fortnightly talks. See The Rose Theatre Kingston website.